On my trip back to Asia from the US at the start of September, I decided to switch around and fly through Europe instead of taking my usual Oneworld airlines through Asia. 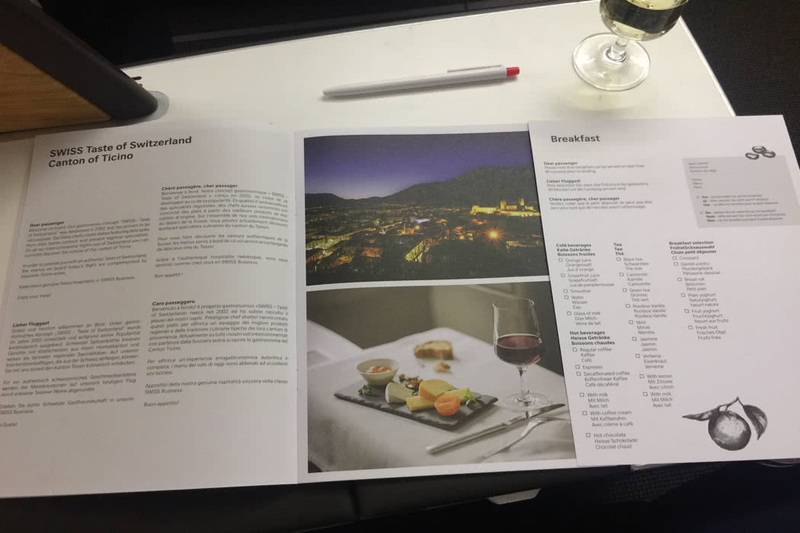 I decided to try out Swiss Airlines, as I have never flown it before even though other members of the Luxury Travel Diary team have reviewed Swiss in Business and Swiss in First Class. 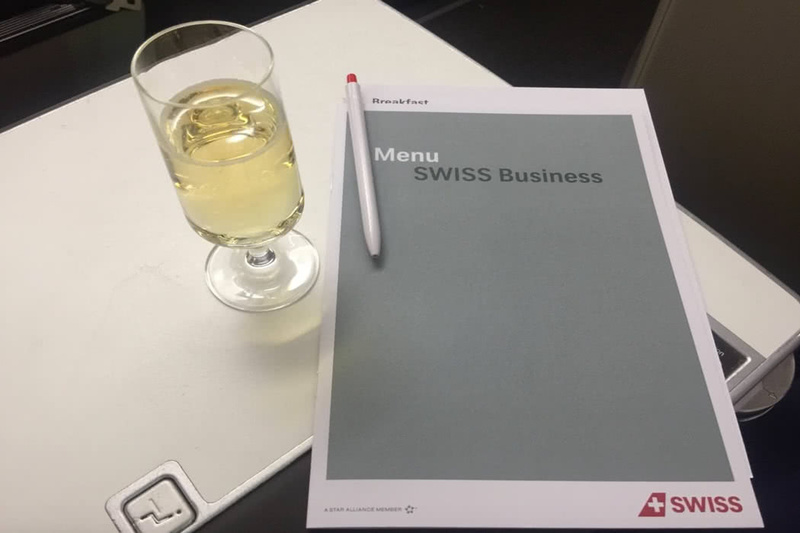 Swiss operates a daily flight to Zurich from JFK Terminal 4, and has its own lounge there. The flight departed at 6:10 PM. 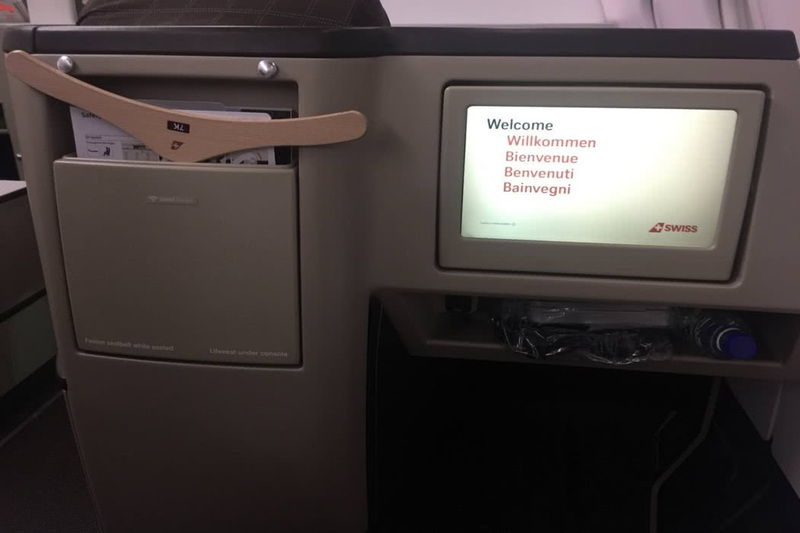 After spending some time in the Swiss lounge at JFK, I went to board my plane. 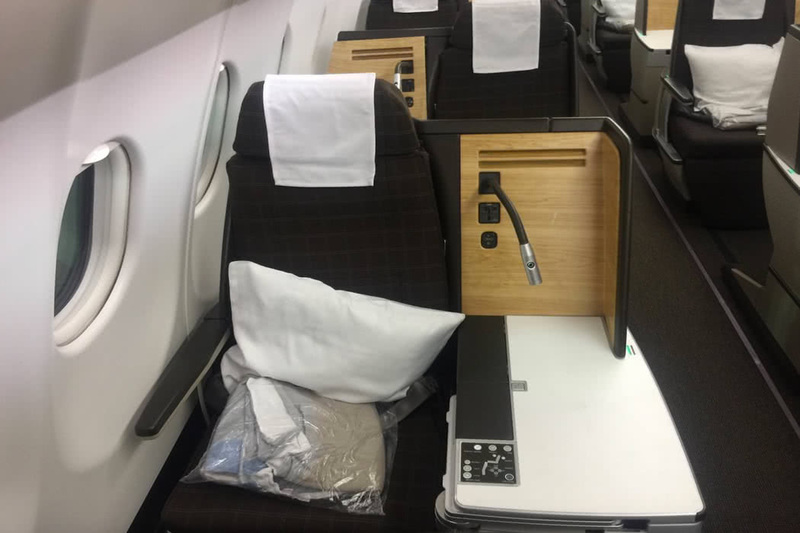 On the A330-300, there are a total of 45 seats in Business class. 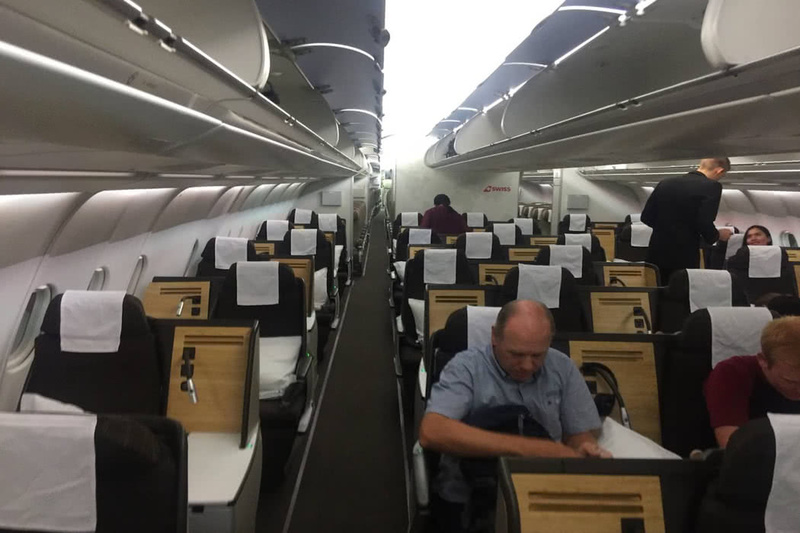 Swiss has configured their plane to have 4 to 5 seats per row in Business Class, either in a 1-2-1 or 2-2-. I took seat 7K, the single seat on the right side of the plane, which has the table panel on the left. This seat configuration is probably one of the most comfortable and private feeling seats in the Business Class cabin. In my opinion, this is the best seat to pick if you fly on this plane. My seat measured 20.5 inches in width and could be reclined to a fully flat bed. The pitch of the seat was 60 inches, which is decent. In front of me was an average sized TV screen which looked a bit old. As my seat was on the inner part along the plane’s fuselage, there was a large magazine rack on the left of the TV screen. You could also hang your suit there. Under the TV screen was a small compartment to store items. 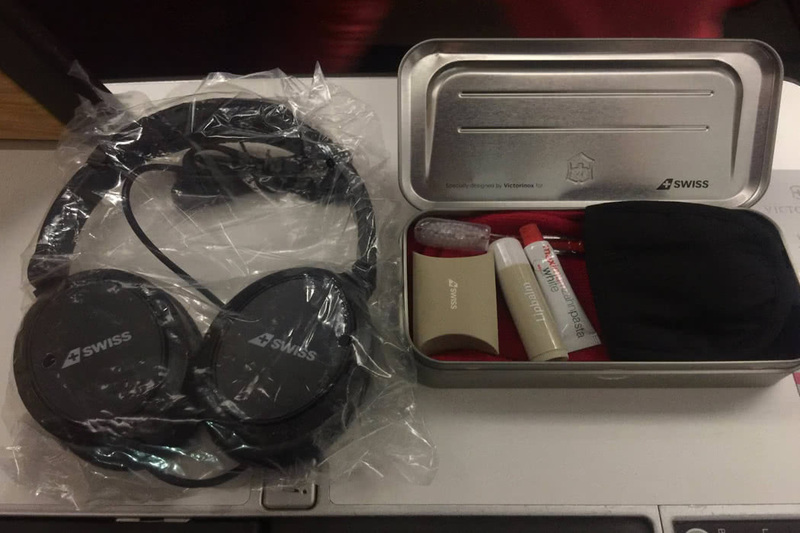 When I first boarded, the noise cancelling headphones and my amenity kit were placed in this compartment. The amenity kit was made by another quintessentially Swiss brand, Victorinox, and was housed in a metal tin box. It had the basics like a pair of compression socks, a dental kit, earplugs, and a lip balm. No swiss knife on the plane, of course! On my seat was a large pillow and a blanket. My table panel was to my left, and it had the seat controls and a pull out dining table in it. On my left was a nice wooden divider panel which had a power supply socket, the earphone socket, and a reading light. After seating, I was given a welcome glass of champagne and the menu. 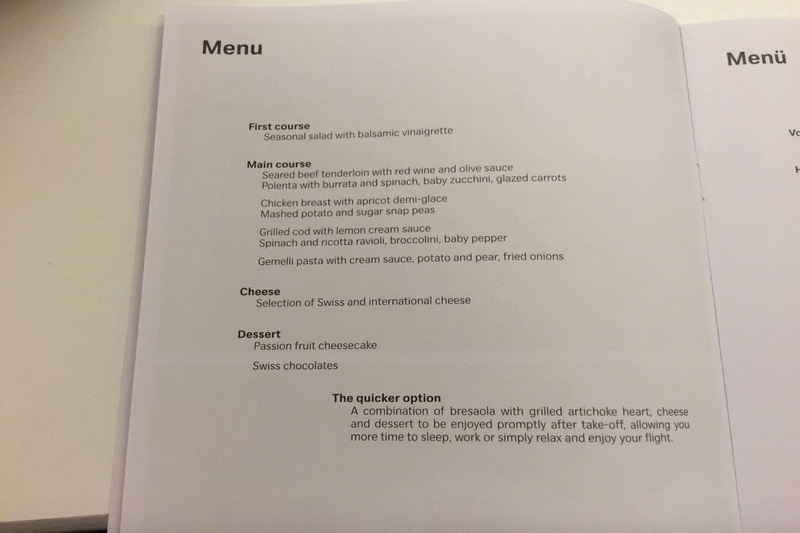 For this flight, they served dinner and an optional breakfast. 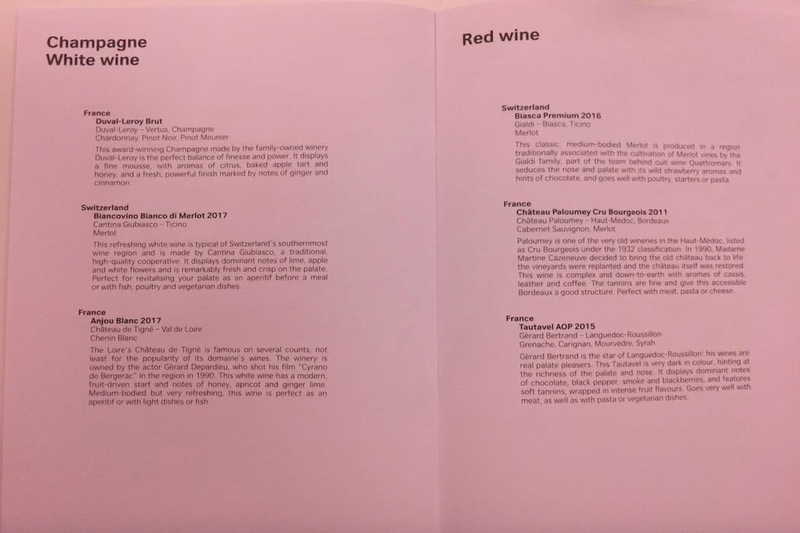 There was also a nice explanation of the dinner and the Swiss chef they partnered with for the month. For my dinner, I had the beef tenderloin as my main, which went well with a nice glass of Swiss red wine. The dinner tray also came with the salad appetizer, bread and some Swiss cheese and grapes. 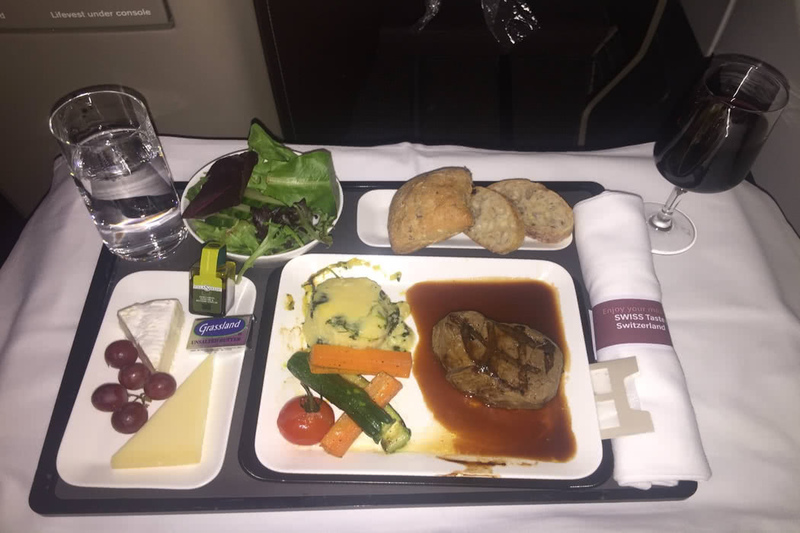 The beef was decent, although I would have preferred it medium rare, something which is almost impossible on planes! Dessert, however, was splendid! 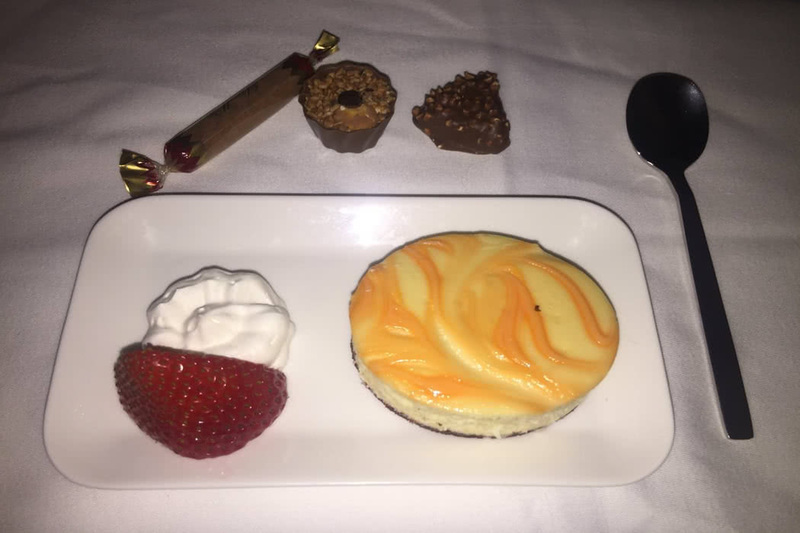 A moist and succulent passion fruit cheesecake was served, while the flight attendants walked around handing out Swiss chocolates. I was quite excited, and took 3 pieces! After that, I watched some movies before catching some sleep. 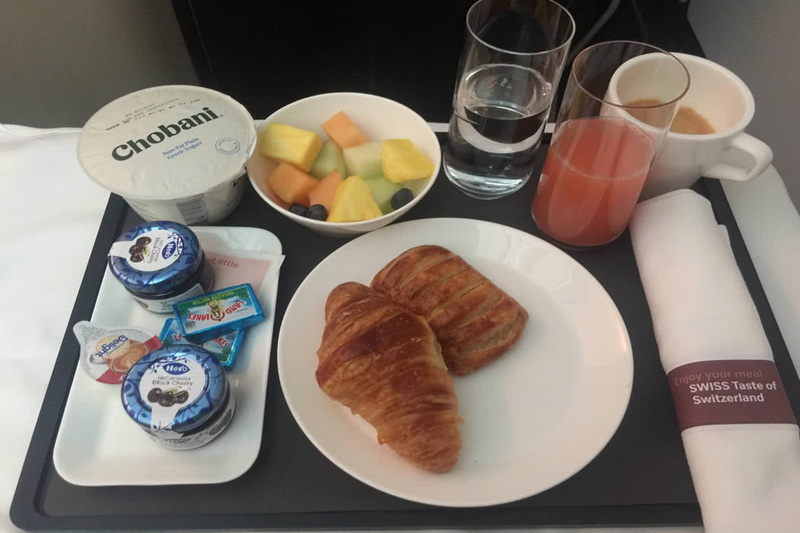 I was woken up about 1 hour before landing and was served my light breakfast options of a croissant and danish, some fresh fruits, yoghurt, grapefruit juice, and of course, coffee. Contrast to Asian carriers that I am used to, the breakfast was quite light. It was, however, sufficient, and tasty in its own right. We landed in Zurich shortly before 8 AM, and I headed into the city for a short stopover trip. My first flight with Swiss was solid, and I looked forward to my second one from Zurich to Bangkok!